This report compares the US DVD from Dimension Home Video (R-Rated) to the Tape from the "Deutscher Videoring" (Unrated). Altogether 24.56 seconds are missing at a total number of 17 cuts. The times refer to the uncut version. 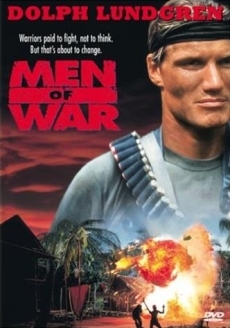 That the action film „Men of War“ staring Dolph Lundgren had to be cut for the Theatrical release in the USA or the aspired R-Rating, respectively, is a long known fact. But more detailed information about the cuts and changes will be given in this report. Conclusion: When watching the movie the cuts are only marginally annoying and if you compare the quality of the (German) tape (see screenshots) to the quality of the US DVD (remastered image in an anamorphic aspect ratio of 2,35:1) the US-DVD is clearly the better option. Note: According to several sources the British DVD contains the Unrated version. Unfortunately I can't say anything about the quality. The R-Rated DVD begins with a Dimension-logo. The old man offers his chopped off hand to the soldiers longer. The tracking shot over the bloody leg stump of a land mine victim is missing. A man gets a gory shot in the back, the R-Rated version only shows him falling. A man gets shot in the chest in a close up. The death of the soldier is longer. The native screams longer and pulls the axe out of his victim. The man who got his throat sliced by Dolphi holds his bleeding wound while Dolphi keeps running in slow motion pushing the man aside. The man gets hit more often before he falls off the suspension bridge. A man lying on the ground gets his throat sliced in a close up. The man who got burned by by fire coming out of the back of Dolphi's rocket launcher can be seen longer. The bullet hole in the man who wanted to kill Dolphi's „better half“ can be seen slightly longer. An insert of the man who got hit was cut out. A shot of the man got cut that the gory bullet hole at the beginning cannot be seen anymore. The blood splattered woman can be seen longer, the blood is running over her cheek. The woman on the beach gets a bullet hole which is not clearly visible, Keefer lowers his weapon. Keefer lowering the weapon was reinserted at this part in the R-Rated version. Then the shot of the two corpses being surrounded by the sea and Keefer exiting the frame. In the Unrated version these two shots were switched, here, Keefer is already exiting the frame then the shot of the two corpses. The spiked Keefer can be seen slightly longer. One shot of Keefer and one of Dolphi were cut out.